Unless it is your birthday or wedding anniversary, July 24 is just another date on the calendar for most Frederick residents. 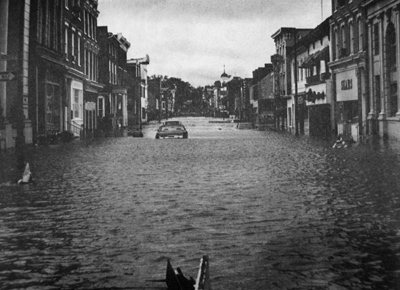 However, those living here throughout much of the 1800s probably approached the day with some anxiety as July 24 was the date of not one, not two, but three significant floods in downtown Frederick. Little is known about the first flood in 1821. The second, in 1848, is referred to as “The Great Flood,” and resulted in millions of dollars in damages. The third, in 1868, washed away the home of Barbara Fritchie, who had died in 1863. A ¾ scale replica of her home was constructed as a tourist attraction in 1927 and remains in place today. 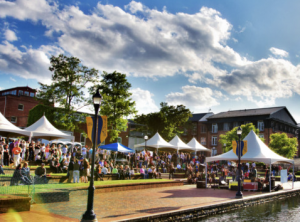 However, it was the Flood of 1976, occurring on October 9 that prompted city leaders to develop Carroll Creek Park. The 1.3-mile park was designed with two underground chambers, designed to carry floodwaters safely through town. Interestingly, Carroll Creek Park was completed and opened to the public in 2006. All these coincidences are enough to make a numerologist giddy. A city known for celebration, Frederick will commemorate the historic July 24 Flood Day on Thursday, July 25 in a festive event on Carroll Creek Park from 5-8pm that will attract hundreds of people and feature live music, food and drink. Actually, Kara Norman and our other good friends at Downtown Frederick Partnership refer to it as Alive@Five. Regardless, I hope to see you there! You can learn more about the Flood of 1976 and the construction of Carroll Creek Park in the Frederick Walking Tour.